Why a giveaway? Well Drop-Dead Denim was my first big bloggy event. This is just my way of celebrating its near-completion. And… I guess it’s also my way of showing my gratitude to you for being part of it and making it so much fun! You know that your mere presence fuels my creativity right? That makes me a happy person. So I want to say thank you. Edited to Add: Item #12 was added to the Giveaway on 27 Sep 2011! NOW! I am just chuffed to have some generous sponsors contributing to today’s giveaway! The first is Brentave Ideas, a dear little etsy shop who’s motto is: “Giving new life to old jeans”. By George, that is my kinda shop. 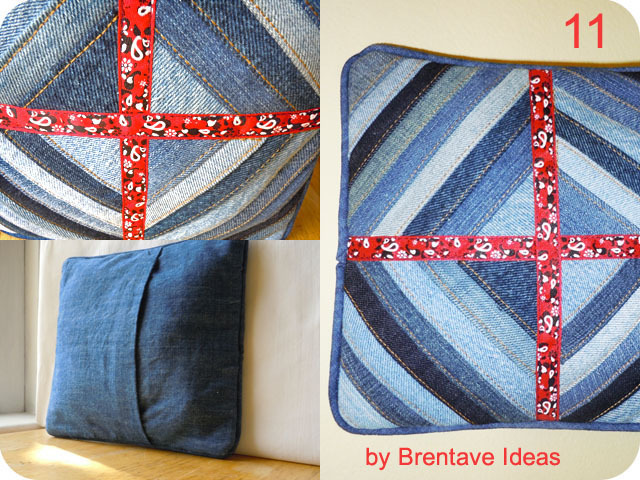 Denise, the owner, has generously donated the handmade denim pillow (Exhibit#11) above! And pictured below are some of the great denim items available in her shop. They include: a Lilly pad lap cover, a bolster pillow, and a wrist pin cushion. Drop by Brentave Ideas and have a gander. Denise would love to have you! 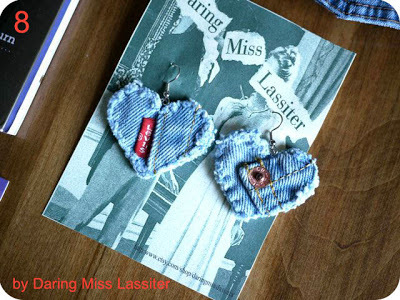 Daring Miss Lassiter, a second lovely etsy shop, has furnished us with the cutest pair of denim heart earrings (Exhibit #8)! Susan creates unique accessories often using denim as a starting point. 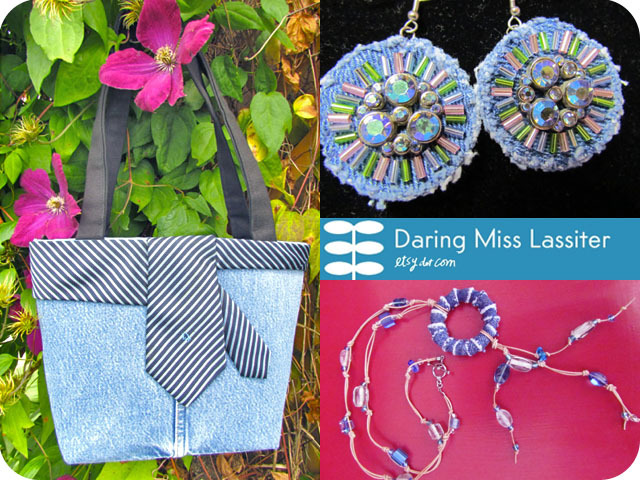 Some favourite denim items in her shop can be seen below and include: the designer tie tote, dangle earrings, and pendant necklace! 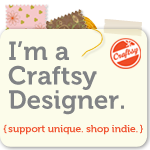 Susan is kindly offering 15% off to shoppers who’ve found her shop via Michele Made Me. Enter coupon code MMMPROMO to receive the discount. Isn’t that brilliant? 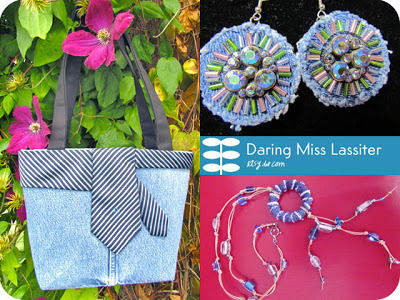 Visit Daring Miss Lassiter at etsy or on Facebook anytime! Here is a closeup of those adorable heart dangle earrings by Daring Miss Lassiter! 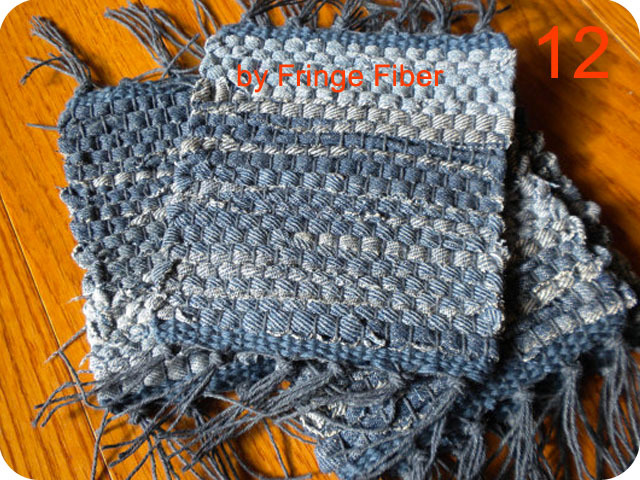 Edited to Add: I’ve been lucky enough to add Fringe Fiber to the giveaway contributors today (27 Sep 2011). See the following paragraph! 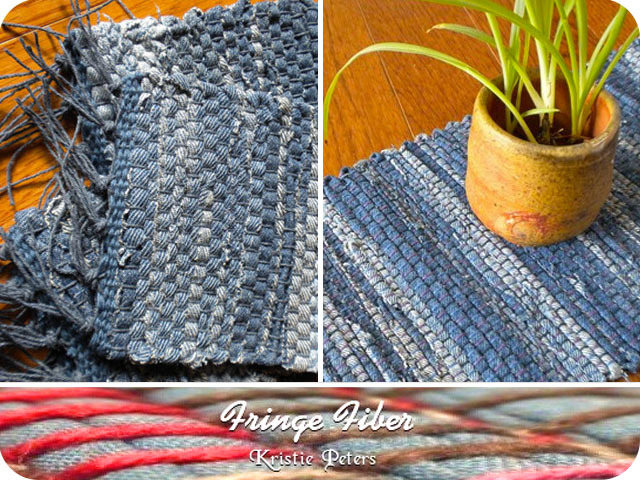 Thirdly, Fringe Fiber is an etsy shop whose owner, Kristie Peters, weaves old denim and other fibers into the rich and gorgeous coasters and table runners that you see in the photo below. Kristie has been weaving most of her adult life, and in her own words: “is particularly drawn to upcycling and repurposing existing materials.” As you’ve probably guessed, Kristie has generously donated some beautiful hand woven denim coasters (Exhibit #12) to today’s giveaway. Kindly visit her at her shop, Fringe Fiber, on her blog Kris Peters, or on Facebook to see her creativity at work! 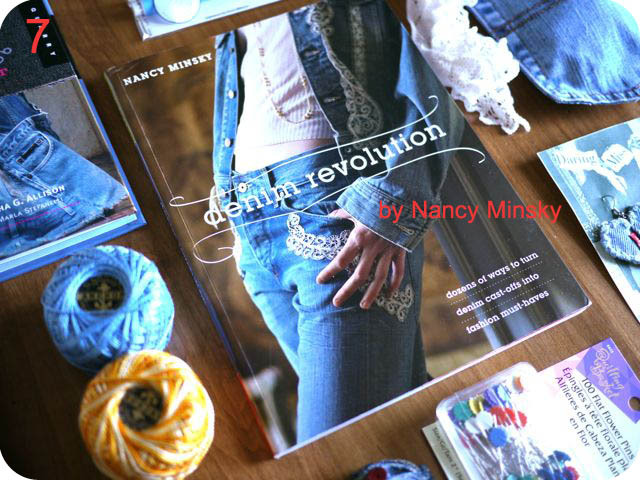 And finally, Nancy Minsky (our Drop-Dead Denim special guest), has graciously supplied one of the winners with a copy of her book, Denim Revolution! Thank you Denise, Susan, Kristie and Nancy for your kind generosity! Let’s get to the heart of the matter, shall we? Please do not have a broken email. I cry mostly real tears when the rightful winner cannot be reached. Please enter on this post telling me of a favourite denim thing you’ve made or dream of making. The giveaway ends Thursday September 29th, 2011, 9 pm EST. Winners will be generated randomly and announced in Friday’s Final Drop-Dead Denim post. Best of luck to you, and have a wonderful day! P.S. I posted yesterday (yes, Sunday!) 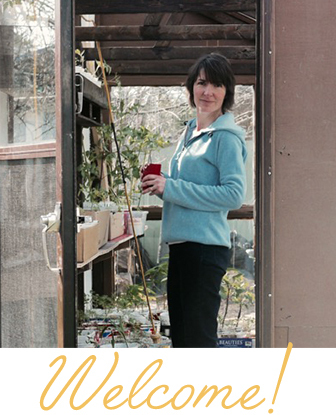 so if you missed Poppyprint Krista’s guest-post, it was a doozy! Do check it out. I SO love that pillow. I know that I'll be keeping all those jeans that don't fit the fam. Lovely giveaway! I dream of making jeans from a pattern I got a few months back. I may be bridging giveaway eligibility rules here, but I just gotta say this month has been jeanius. The denim thing I look most forward to making is a mystery project that I will concoct with the Quilters of Gees Bend next month in the two day workshop I'm doing with them. All I know is that old jeans (and other clothing and fabric scraps) will be involved. Stay tuned!! Thanks again M, for a lot of brilliant ideas and fun posts! "Please be from somewhere"…. do you typically have people post from nowhere? LOL. j/k My favorite thing made from denim is this small pillow I made for my son from an old pair of jeans. He LOVES it! aahaa…such a nice package! 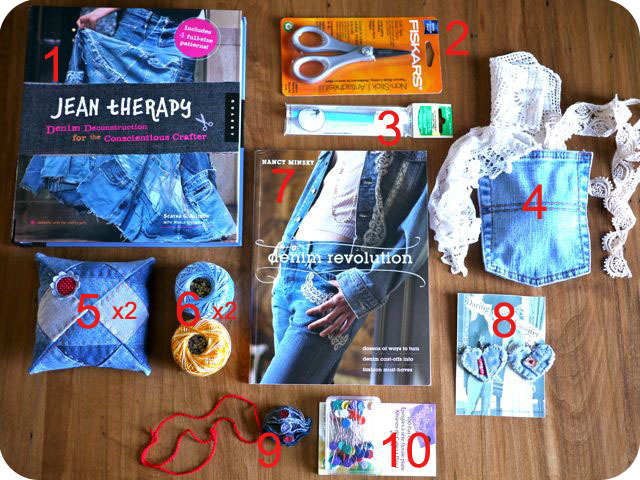 Love it..i would love to have any of your handmade creation & the magazines seems amazing about denim creations! really interesting copies! What a great giveaway! I like it very-very much! Well, as for my favorite thing made from denim – it`s a summer hat with a flower for my younger daughter. What a great giveaway – and yippee I'm from somewhere so that's the first hurdle crossed! 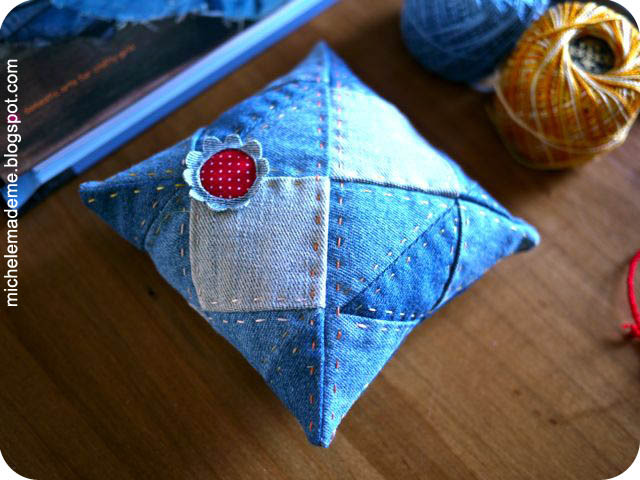 Jeans that just get worn to death are made into bags of one form or another – what a great idea to make a denim pincushion! Wow what a brilliant giveaway, I love the pillow. It's been a really inspirational month and when I get a bit more time I will retrieve the bin liner of denim from the loft and get sewing! My favourite denim item I have made is/are soft books for babies (posted in the flickr group), they are simple yet beautiful. I now need to make a least 2 more for the niece and nephew that arrived this summer. Best denim item I've made so far was a ragged denim bag lined in Laurel Burch cat fabric…still my favourite go to bag. I've made some denim totes and love the look, but always wanted to make a denim miniskirt with patterned fabric fringes…it's on the list! I'm from a very southern somewhere and I have a real email addy. I would love to make something other than jean purses. Pillows and dolls are something I would like to try to make someday. The bolster pillow was really cool !!! Hola, gracias por organizar el sorteo. Te escribo desde Valencia-ESPAÑA. Tengo en proyecto hacer una bolsa para llevar la sombrilla a la playa ( vivo muy cerquita, a 5 minutos andando). Con una pernera del pantalón se puede hacer. Te dejo mi email y mi blog. The bolster is my favorite. I'm from all over, wife of retired military. I love to make quilts from old jeans and my friends love them as gifts. Your denim posts have been so much fun, thanks for sharing all of them. There was a time that my collection of old jeans was beginning to take over my storage shelf — sooooo I have loved your denim series!! My favorite denim creation is a gym bag made from an old pair of jeans and embellished with ruffles, trim, buttons and bows. You have motivated me to start making some more. I had forgotten how fun it was!! Thanks. I was just gifted with a whole smash of previously-loved denim and am looking for more ways to use it besides the jackets I like to make. I've seen lots of inspiration here. Thanks for a chance to win!! I'm from Utah. My e-mail is attached to my account and it works (no tears on my account. 😉 ) My favorite thing I made from denim is a huge 8' square quilt made for my mom from jeans from her children and grandchildren. It's two layers thick and so heavy she won't use it because she doesn't want it to get dirty because she doesn't want to have to wash it. 🙂 Well, I tried anyway. I once made a pencil case out of 2 jeans pockets (stitched together). This was before I really knew how to sew and it is now "dead". Everyone at school thought it was really cool though. I still have a tub full of denium, but the scrappy rag edge quilts I have made are still my favorite. They last years and are oh so warm. I love the bolster pillows you show, and the slipper tutorial is on the top of my list now! I love Gees Bend quilts. Can't wait to see those pictures. I made my grandson a hobby horse out of jeans. Pictured in my blog somewhere. I would love to see those books and get more ideas. Such a great giveaway!!!! I love using denim in my projects!!! Brittany's purse is my favorite made by me denim project!!! I have been enjoying seeing all of these denim ideas. I have been redecorating my daughter's bedroom and I've been using old jeans to do so. I used old jeans to make her curtains and a decorative pillow for her bed. I also covered a can with blue jeans (leg and back pocket) to make her a pencil holder. I'd love to win this giveaway! I'm from the U.S. I love things made using old jeans! They are so durable and comfy, and have such a nice vintage look. I have a stack of jeans waiting to be made into a picnic blanket – but I will need a book of ideas for using all the denim leftovers! I like the teeny hearts with the rivet and Levis tag. I love denim, is so versatile! I intent to do a tote bag with some old jeans. I bought a tiny pair of baby jeans from a charity shop a few weeks ago. They have the most delightful embroidery and buttons on. I want to do something special with them, but haven't decided what yet! I intend reading back through all your jeanius posts for ideas! I've been saving jeans to make a quilt … just have taken the plunge yet. I have truly enjoyed your denim creations this month, and am looking forward to my post-selling season (after holiday shows are done) to pulling out all those denim jean scraps to have some similar creative fun. I've made little bags, and used denim scraps for throw blankets and the "mat" for framed items. Thanks again, and keep up the excellent creative inspiration! I never thought that one can make of jeans are so many beautiful things. I love them all. i think the weight of a denim quilt would be perfect, but id mix in regular cotton fabrics too! I am from somewhere, have a working e-mail address and my favorite thing I've made from denim is a crazy quilt style bear made from my employees old jeans. I am making a denim (10 minute quilt block) quilt for my son's friend. It is mostly a recycled quilt using old jeans and plaid shirts, that I picked up at the boys/girls store during their $4 bag sale. I should have been made for his high school graduation this past May. But i did'nt know what kind of quilt I wanted to make him. Thank you for the chance at the giveaway! what a wonderful giveaway! love everything about old denim. i'd love to make a rug…maybe braided from old denim…have really enjoyed the denim projects! I dream of making bags, denim bags, out of my kids' old, outgrown denim jeans. I am so glad to have found your blog with all your ideas. Thank you!! Look at all of those cool prizes! One of the neatest things I ever made out of old jeans was a duffel bag — it was so easy too, I just used the leg because it was already the right shape. Cut 2 circles and sew them onto the ends, open the leg seam and put in a zipper, then use the waistband for handles. Practically indestructible too! I'm planning to make jean pocket potholders as gifts for Christmas! Please enter me in the drawing. I'm from the mid-Atlantic region. This is such a wonderful giveaway! I've made a denim purse but have dreams of making many things from denim, especially recycled jeans! Those little denim earrings are adorable, I might have to make a pair! The prizes are awesome!! Wow! The best thing that I ever made was a denim purse for my daughter when she was 8 yrs old. She still has it!! Love the giveaway stuff-so many neat things. The earrings are so darn cute. I am from an awesome place (Maine!). The best denim thing I have made is a small bag-love it. I definitely need to make some new denim things now after Drop Dead Denim! Wow!! What an amazing blog you have! I would really like to make a denim bag for day to day use and a tote for our much needed short trips. I'd like to teach my daughter to make some awesome from some of her old denim too! I made some simple, denim handbags which sold well at a local event in Prescott, AZ. I made a frilly dilly bag from denim and an ipod pouch too !! Love love LOVE all the denim stuff!! I've been hoarding all the faded/non-fitting/ripped denim my family doesn't need or can't use anymore in the hopes that I will get around to making at least something from these tutorials! Thanks for hosting this denim month! 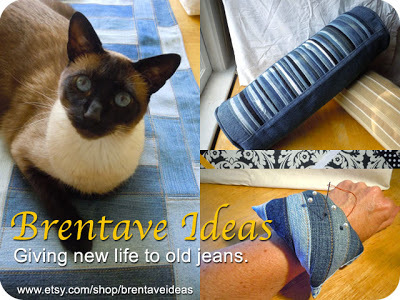 I love Denim Month, so many brilliant ideas! I'm planning to make denim slippers or Mary Janes, yours are so cute. And a bag with the rainbow sherbet painting method. Please enter my name in this fab give a way. I am making a denim boho bag. I love re-purposing denim and of course, I LIVE in denim! I gotta check out those heart earrings!! I love the denim pincushions! I would like to participate, but I seriously doubt you would deliver to Europe! I have really enjoyed your Drop-dead Denim event! So much fun stuff to make from old jeans! Thanks to your posts, I have a salvageable pair sitting in my craft room at the moment…I am thinking about using those to make flags for a banner and getting a lighter pair from the thrift store to make letters for the banner to hang in my nephew's room! Thanks for the great giveaway and inspiration! I love my potholders that the back is my hubbies old jeans and the front is some cat material I've had in my stash for years. I sandwiched a towel between them. So cute and work so well. Thanks for the posts and the giveaway. I've loved your denim month features and feel inspired to have a go at a denim project, now where to start ………. Like many sewers/crafters, I see everything as a possible Future Project. Old jeans and denim are no-brainers. It's hard to name a favorite, but the first that comes to mind is an adorable apron. Very, very hard to give away! This was such a wonderful idea I've decided to take it to school. In November, I'm starting a handwork club for grade 6-8 students. We're going to start with "Upcycle Your Worn, Torn Denim" and let the kids get creative. 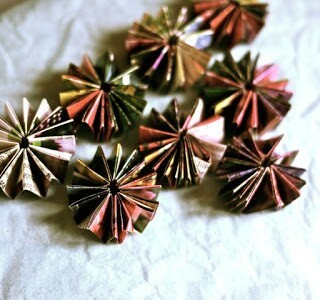 To get the group project kick-started, I'm going to provide some samples of jewelry, bags, who-knows-what-else? At home, I think I'll start feeding the boys more bean sprouts in the hopes that they sprout faster and outgrow a couple more pairs jeans… soon! or, just be able to do that painted sherbet effect on some of my daughter's jeans! Hello..found you VIA everything etsy 100 Xmas ornaments. I intend to make denim pencil cases for my kids for Xmas, but have now added your tree ornaments. And wow those heart earings are gorgeous. I'm from México! and I love your blog! Denim is one of my favorite fabrics. I make a quiet book for my son whit denim. I love your blog. I made a jean quilt throw. I am working on 2 heavy duty totes! What a great giveaway ! My husband cut a pair of jeans into shorts in the summer and I can't bear throwing the fabric so I am going to make a dress for my 3 year old daughter. It will have denim appliqué and I wonder if I should add sleeves from an old felted jumper. It's autumn here you see! I once took a thrift store pair of jeans (that I didn't try on, but they fit perfectly!) and sewed a bunch of t-shirt patches to it. I did this in high school in my I'll wear anything phase. They got a lot of attention. I don't think I'd do that now. I've got quite a few pairs of old jeans laying around and I'd love more ideas for reusing them. I'm from Iowa, farm country, so denim is everywhere. I've woven several denim rugs. Many years ago I made a couple of denim vests, pieced together from worn jeans. Lined them with faux suede. They were wonderful! Thanks for the chance to win something great! I have so enjoyed the posts and do thank you for the cracking ideas, from so many interesting sources, yourself included, you have brought together! I (half) made a rag rug with denim strips, it was SO VERY heavy and of course I made it far too big ( like 6' x 4') to manhandle it easily on my lap to work on it. And I started at the edges instead of the centre, so by the time I got to the middle area, it was hard to get at it! I passed it on to another brave soul who I hope did manage to finish it lol However I have promised msyelf to make another, smaller version – and I will! I love making blue jean tote bags from old jeans. I am a crafting recycle nut on many things. 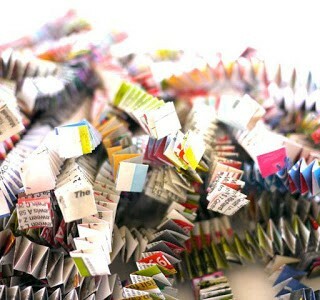 There are so many beautiful creations one can do with scrap blue jean material. Made bird houses once on a vest that was plain. Love your blue jean skirt, so colorful and pretty. I've been intimidated to work with denim in the past but have been patching a lot of pants and shorts lately. I would love to start working with denim more especially with accessories like those earrings. How fun! favorite thing made from denim: three small messenger bags for my little ones, each with different hand embroidered pictures, 2 of which were made from my older one's drawings (my youngest couldn't draw a picture yet). favorite part of the youngest's bag was the strap I made from the hem of my shorts. thanks for this post! 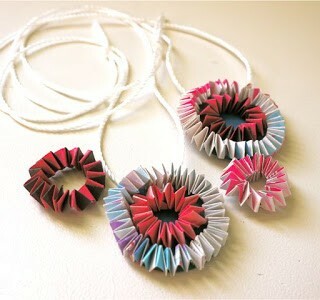 also, would love to make a rag rug someday from denim. I have made some denim rag rugs and some denim quilts that I have really liked how they turned out. One of the ones I had the most fun with was a a quilt made of only denim squares and then I appliqued lady bugs out of red gingham and other fun red fabrics on the top randomly. I have made so many things with denim like purses,bags,slippers, and the best is the quilt I made 108 inches long by 92 inches wide. It is so heavy I didn't think I would never get it tied. It was to big for me to quilt it on my machine so I tied it with heavy cotton yarn. It is all 4 1/2"x4 1/2" squares with a fannel back.